Supporting and challenging the next generation of engineers, Mazak has created a puzzle for those attending GUTS. Exhibition – Yamazaki Mazak reaffirmed its commitment to the next generation of engineers with a third consecutive appearance at the Get Up To Speed with STEM (GUTS) event, held at the Magna Science Adventure Centre in Rotherham, on 27th March. GUTS, which is in its ninth year, aims to highlight the broad opportunities available to young people in the North of England who are keen on exploring a future career in the engineering and manufacturing sector. 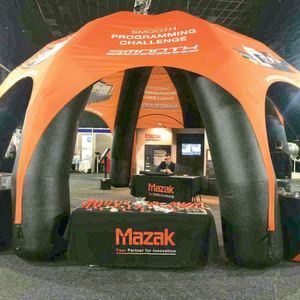 With the event welcoming over 3,000 visitors, Mazak took the opportunity to showcase the latest generation of the world’s fastest CNC, Smooth, via an on-stand interactive simulated control panel. To encourage active engagement with the young audience, Mazak offered students the opportunity to solve an interactive puzzle on the CNC while wearing visual-assisted glasses and earpieces. 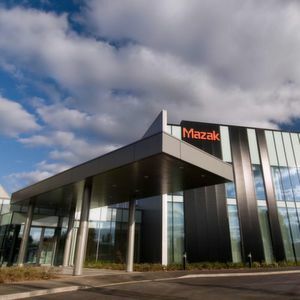 Furthermore, participants could speak directly with a Mazak engineer based at the company’s European headquarters in Worcester to help them solve the puzzle, demonstrating the concept of connected manufacturing to the watching audience. The Mazak stand also featured a video simulation of a variety of machined parts from everyday items that could be made using a Mazak machine tool, to emphasise the wide-ranging impact manufacturing has on daily life. Alan Mucklow, Managing Director UK & Ireland Sales Division, commented: “Given the well-documented skills shortage facing the manufacturing industry, it is vital that we proactively engage with students from a young age, to familiarise them with the wonderful – and at times, limitless – opportunities a career in manufacturing can deliver.